Accurately mimicking our ancestors is impossible and unnecessary. 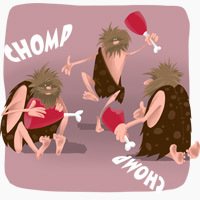 Some authors in the Paleo / primal / whole food blogosphere have raised concerns about using the term Paleo to describe the concept that some people are led to believe as trying to accurately mimic our ancestor’s diet. This can lead to mistakes, unnecessary dogma or an unhealthy patronizing attitude. A lot of people now even ask if a certain food is “Paleo”, while the correct question to ask is if that food is health promoting in the context and amount that it’s consumed, not if it’s “Paleo”. Some cases can be made against foods that would normally be healthy for some people, but that might cause problems in some specific conditions, but shunning foods on the basis that our Paleolithic ancestors didn’t have access to them is a huge mistake. For example, potatoes are in the nightshade family and can be a problem for some people with some autoimmune or digestive issues, but are perfectly healthy and nutritious for others. Those who truly understand the meaning of the concept know that Paleo represents a dietary approach based around the most likely dietary habits of humans prior to the advent of widespread grain cultivation as well as biochemical evidence of how we react to food. This, of course, means that modern foods are not automatically out of the question, as long as those foods are structurally and chemically similar to the foods of our evolutionary past. Olive oil and butter fat are two other examples of rather modern foods that are similar to the foods our bodies are used to dealing with. Butter fat, a novel food, is much healthier than poultry fat or fat from nuts and seeds. Even if our anthropological evidence gets better and better, we will never know for sure what the typical diet of our ancestors was. Things are really hard to figure out when the only remaining evidence is bone remains from a few select areas of the world. The diet of our ancestors was very different depending on the chosen time period, geography and season. Some regions were a great place to get access to fish and shellfish, others were more abundant in tropical plants and starchy carbohydrate sources, yet others were scarce in nutrient-dense plant foods, but rich in game meat. In that sense, it makes more sense to think of a Paleo diet more like a general idea of the dietary milieu available to humans before grain cultivation and chronic disease epidemics. Even if we knew beyond the shadow of a doubt what our ancestors ate and if we agreed on food choices from a specific period and a specific location, chances are that most of those foods wouldn’t be available to us anyway. I doubt that chicken and beef were food choices for many of our ancestors, yet it doesn’t make those choices much different than Paleolithic fowls and ruminants. Many ancient plant foods are also much different than what we find today in grocery stores. It is a fallacy to assume that everything our ancestors did was the right thing for their health. The reason why their diet was healthy in most cases is that grains, legumes, seed oils and high amounts of fructose weren’t available. Many of our ancestors still died or got sick from starvation, nutrient deficiencies and toxic plant consumption. In that line of thinking, even if we knew for sure the dietary habits of some Paleolithic groups, there is still no way to know if those groups fell prey to specific nutrient deficiencies or toxins that would be undetectable in bone remains. Similarly, even if we knew that they were healthy, how could we know if they had optimal health? This is also why the idea of sensationalist journalists who recently affirmed that there is no solid reason to cut grains because some of our ancestors ate grains is a completely bogus one. This is a trap that we can easily fall into when basing our views only on observation. Where observations about our ancestor’s eating habits come in handy is in the formulation of hypotheses that can then be further studied in controlled settings in order to really know how food affects our biochemistry and what should be eaten to optimize health. This consensus between anthropological observation and science is the best framework to make wise choices concerning what to eat and what not to eat. For example, with such a framework, we can make a better choice of greatly limiting honey consumption even if it was available to some of our ancestors or even enjoyed in greater amounts by some groups like the Hadza. The fact that some of our ancestors enjoyed it doesn’t make fructose better for our livers. The next time you ask yourself if a food is healthy or not, consider the potential toxins in that food as well as its nutritional value. Healthy food is non-toxic and nutritious. The main toxins today are from seed oils, fructose, grains and legumes.